Set along the coasts of Bang Rak Beach, Villa Baan Luicia offers panoramic views of Koh Phangan, Samui’s renowned Big Buddha statue, and the scenic northern coasts of the island. 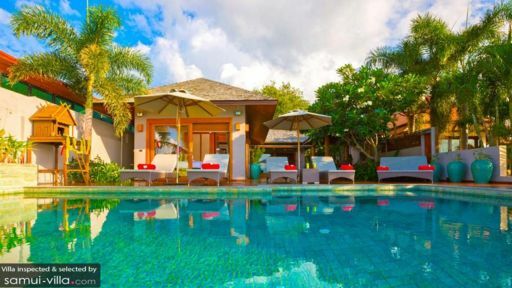 The villa’s prime beachfront locationmeans that guests are provided with direct access to the beach, and are placed within close proximity to a variety of travel attractions, dining establishments, nightclubs, spas and watersports providers. Three bedrooms accommodate a total of ten guests (two of the bedrooms feature an indoor lounge that can be easily rearranged to accommodate additional guests). Two of the rooms are housed in a single pavilion. These rooms share a cosy communal lounge, and overlook the tropical garden. The master bedroom is located separately in an oceanfront pavilion. Guests will enjoy stunning views of the sea right from the comforts of the cushiony bed, and be provided with plush amenities such as a king size bed, a miniature fridge, air conditioner, indoor and outdoor lounge, as well as a luxurious bathroom equipped with a semi-outdoor rain shower. A sparkling infinity pooltakes center stage in the outdoor grounds. 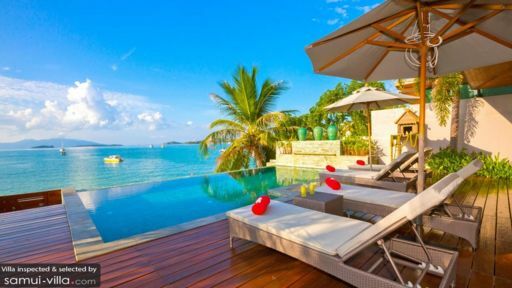 A row of sun loungers flank the pool; these are perfect spots for soaking up the tropical sun, relaxing with an icy drink or curling up for a quiet session of reading. When you need to cool down from the heat, make a splash and jump right into the turquoise waters of the pool. When the evening beckons, take a seat at the poolside dining table to enjoy a sumptuous barbecue feast under the stars. Beautiful wood furnishing and fixtures, antique pieces and exquisite paintings adorn the living spaces of the villa. Vaulted ceilings create a sense of spaciousness within, and the glass sliding doors allow the golden tropical rays to cascade in. A pillowy sofa offers a comfortable spot for a nap, the bookshelf throws up plenty of titles for bookworms, and a well-stocked media library provides film buffs with endless choices for a movie marathon. Baan Lucia offers housekeeping services, security service, personal guest services, airport transfers and a daily breakfast service. Amenities available at additional cost include welcome drinks, in-villa massages, laundry service, personal driver services, personal chef services (for lunch and dinner) and child minding services. 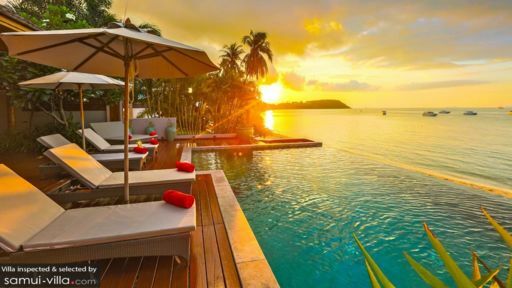 Baan Lucia occupies a prime beachfront location in Bangrak, a coastal town in North Samui. The villa puts you just steps away from Bangrak Beach, and within easy access to restaurants and local amenities. Choose from a variety of restaurants and cuisines, which range from Thai to Italian or French fare. We like Salefino for its incredible Mediterranean dishes and stunning coastal views. Supattra Thai Dining boasts cosy ambience and picturesque surroundings, and La Côte de Boeuf is a great option if you’re looking to savour authentic French dishes. You’ll also find a good selection of dining venues at Fisherman’s Village, a bustling hub located a four-minute drive away from your villa. Key cultural attractions in the vicinity include the iconic Wat Phra Yai, or Big Buddha; the focal point here is the temple’s golden 12-metre seated Buddha statue. Located just seven minutes’ drive from your villa, Wat Plai Laem is a must-see for its colourful architecture and striking 18-arm Guanyin statue. Other nearby attractions include luxury spa venue Belmond Napasai, Yogarden Samui, a yoga studio, Island Organics, a cooking school with an organic micro farm and Samui Disc Golf, a venue for frisbee golf games. Mae Nam Pier, located about 20 minutes’ drive away has ferry boat rides to Ko Tao, an offshore island known for its exceptional freediving and scuba diving experiences. Great Villa with stunning view. 7 eleven and food restaurant in front of the door. Excellent service. Late Checkout without additional fee. We had a great time here and come definitely back.